i love that fleeting feeling . . .
yes could be . . .
sometimes, we open the image file back in the studio and cringe b/c what we thought we saw and thought we captured isn't quite there.....there's always so much luck involved in making pictures.....too often the image in our head is merely an "almost"
BUT one thing i'd so hoped to do during daniel and jenny's wedding was to really get low with the full frame and utilize the wide angle . . . and capture how these beckett brothers (they've ALL served in the marine corps) feel about each other and oh i'm happy! 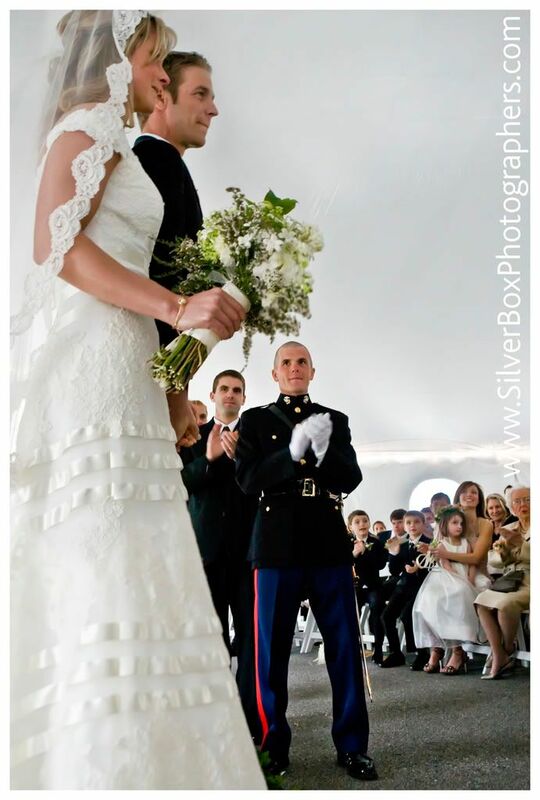 daniel has 3 brothers -- his youngest, andrew, in uniform, was his best man. right behind the applauding marine: matt, who's the father of daniel's only neice (the flower girl) and nephews (sitting beside her) -- and it's perhaps matt's wife suzanne that is the most animated of all in this image. AND we can even see a wee bit of adam, the oldest of the beckett boys. AND (like icing on the cake) that's daniel's grandma sitting beside suzanne. i'm going to boldy put all humility aside for a moment. ok, this image is NOT perfect . . . there are a few minor details that if time would stand still rather than pass by in a fraction of a second i'd tweak but overall . . .
oh let's dance, jump and sing!!!!!!!!!! ok ONE more shot with wonderful new lens . . .